I love jewellery, but most of the mainstream designs don’t really suit my style. That’s why I’m so keen on the unique creations by local design houses including Chinoiserie Blu and Choo Yilin. Check out some Baba Nyoyna inspired creations sure to make you stand out from the crowd! Subscribe to my monthly newsletter to learn more and keep up to date with my artwork, events and art workshops. An excursion organised by Print Culture Studio! Looking to get a first-hand look into Peranakan culture? 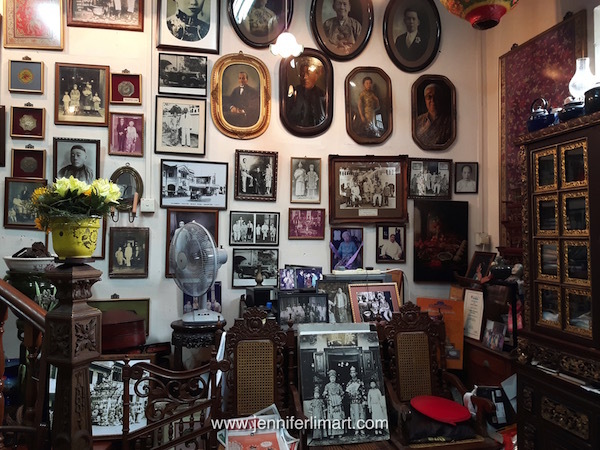 Katong Antique House on East Coast Road is the perfect place to experience life in a Peranakan family home. Something of a best-kept secret until now, this private gallery offers tours to help people learn about the unique cultural practices of the Peranakan Chinese. Curator and owner Peter Wee has spent decades collecting a wide range of items to reflect the unique facets of Peranakan daily life. I recently took a group of clients and students to look more closely into this fascinating culture. These colourful enamel plates and kueh sweet molds are very practical and collectable! Also known in the Peranakan community as Baba Wee, Peter inherited the some 100-year shophouse from his grandfather and has since successfully recreated a typical household setup of a bygone era. Visitors will find a casual display of Batik Sarong, Kebaya blouses, Kasut Manek beaded slippers, Nyonya ware ceramics and Peranakan tiles. From the entrance hall to the kitchen, each room has been carefully restored to reflect the customs and practices of a typical Peranakan family at the turn of the century. Baba Wee's ancestors going back seven generations! During the 45-minute tour, Peter explained that the Peranakans are descendants of Chinese traders who settled in Malacca and around the coastal areas of Java and Sumatra as early as the 15th century. In the early 20th century, many Peranakans were educated at missionary schools and some even converted to Catholicism. 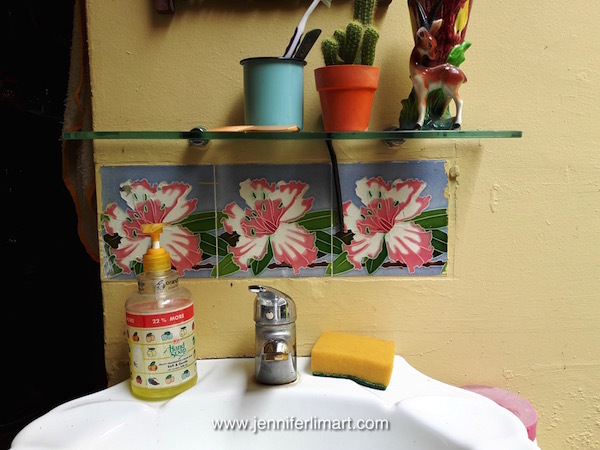 Due to this, common features of a Peranakan home included a Catholic home altar, Taoist deities and Buddhist religious decorations - all side by side! See the Catholic altar behind...along with the three Star Gods namely Fu, Lu and Shou. According to Peter, about 80% of Peranakan culture has its roots in Hokkien and Teochew traditions. The rest comes from English, Dutch, Malay and Indian sources. The flexible outlook of the Peranakans and their interest in adopting and integrating bits and pieces from other cultures is an admirable trait needed more than ever in our often-troubled world. The tour was wrapped up over a spot of tea served with Peter's quaint antique tea cups. The delicious pineapple tarts also went down well, and were again another example a Western cooking tradition combined with local ingredients. Tea and time to chat! As President of the Peranakan Association of Singapore, Peter often has copies of the association's highly collectable and still free magazine, The Peranakan. If you're looking to enjoy this magazine, please join the association while they are still offering life-time membership! Specialist books on Peranakan culture, and out-of-stock copies of museum catalogues can also be found. You can also enjoy locally made kueh sweets and Peranakan inspired gifts including my original greeting cards. Don't miss the chance to experience the real-life essence of Peranakan culture - book your tour soon! Close to the city but a slower pace of life on East Coast Road. Top Five Peranakan Things to Do in Singapore! I found this red-haired Nyonya at The Peranakan Museum dressed in Sarong Kebaya! Spicy dishes, tropical coloured outfits and grand shophouses - the Peranakan Chinese feature frequently in Singapore tourism brochures but their true identity still remains mysterious to many. My research into my father’s background has helped me to discover that this intriguing culture extends well beyond just prawn paste and beaded slippers. So who are these Chinese-looking people with unique tastes influenced by Chinese, Malay and European elements? Some recent videos I found on Youtube describing Peranakan culture - enjoy! 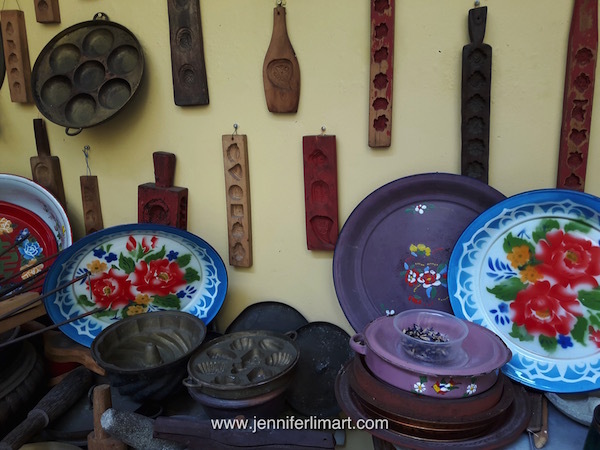 Top 5 Peranakan Things To Do in Singapore! Peranakan culture has many elements and influences including those from European, Chinese and Malay sources. Here are some things you can do in Singapore to learn more about the 'Straits Chinese'! Singapore is famous for its gorgeous sarong kebaya, the Nyonya outfit that inspired the shapely uniform worn by female flight attendants of Singapore Airlines. But it's not easy to find where the good shops are unless you've spent time pounding the pavement! Save your feet and check out my blog post on where to buy this unique sarong skirt and kebaya blouse outfit loved by many Peranakan ladies.